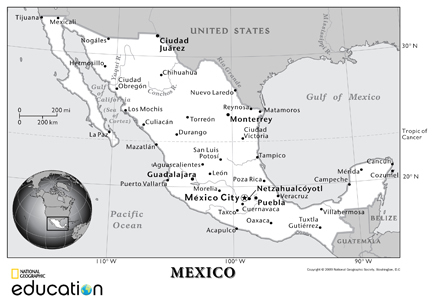 Constructed: 600 – 900 A.D.
Where is Chichen Itza located? Chichen Itza is the most visited ancient mayan archaeological site because of its extraordinary architecture and its geographical location. The ruins at Chichen Itza cover an area of 6.5 sq km (2.5 sq miles) and can be toured in a day. This site is situated in south-central Yucatán state, Mexico. It is located about 90 miles (150 km) east-northeast of Uxmal and 75 miles (120 km) east-southeast of the modern city of Mérida. How to get to Chichen Itza? The two international airports nearest to Chichen Itza are Cancun International Airport and Merida International Airport. Major international airlines as well as charter airlines have direct or connecting flights to Cancun every day. Cancun Airport International is easy accessible from almost every major city in the world. Chichen Itza is located one mile outside of the small town of Piste. Many tourists visit Chichen Itza as a day trip, especially from Cancun, more than 100 miles away or an hour and a half away from Merida, the capital of Yucatan. 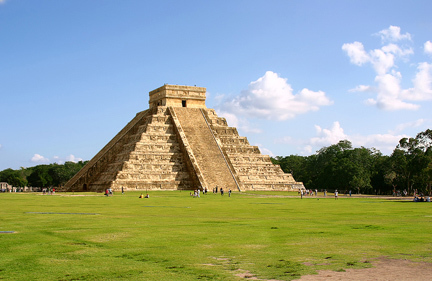 It is possible to visit Chichen Itza as a day trip from either location easily. Chichen Itza can be visited by travel agency daily tours, rental car, or public bus lines that leave about every hour. Hotel & Bungalows Mayaland is a world-Class resort in a unique Tropical setting inside the Chichen Itza Archeological Park. It is one of the 100 hotels on National Geographic "The Stay List" 2009 and 2011. It is the most awarded resort in Yucatan and is a member of the Rain Forest Alliance. There are over 100 acres of unique tropical gardens. It has award winning restaurants serving Mayan, Yucatan, Mexican and International delicacies. Mayaland was the first Hotel built at Chichen Itza (in 1923), and, with its superb location amidst the temples, the first within an ancient site in the world. In a way, it's as much a landmark as the pyramids that tower above it. Hacienda Chichen & Yaxkin Spa is an eco-friendly boutique hotel. The Hacienda Chichen is committed to sustainable tourism and is devoted to Mayan culture and local community welfare. The resort consciously promotes an eco friendly environment rooted in Mayan tradition, which presents guests with plenty of romantic charm. An ambiance of ‘home away from home’ welcomes the Hacienda Chichen guests. The property’s close proximity to the adjourning Chichen Itza ruins is a major plus for those travelers wishing to avoid the crowds. The Lodge at Chichen Itza is a world class jungle resort in the heart of Chichen Itza. Bungalows built in traditional Mayan style with handcarved woods, stone, native marble, handmade stained glass and thatch. Bungalows are equipped with all the amenities of the main house. They are oriented for maximum privacy and the best of views. The resort has been named 3 times by National Geographic Traveler. The Lodge at Chichen Itza sits on 100 acres of beautifully landscaped gardens in the heart of the archaeological park, with its own entrance to the Mayan temples. It is a member of the Rain Forest Alliance. Have you already visited Chichen Itza or plan on visiting? Do you have an interesting Chichen Itza travel story? We would love to hear about your Chichen Itza travel experiences, your reviews of hotels, restaurants, or tours, your top travel tips and any recommendations...anything about the Chichen Itza travel that you can share with us. Unlock the mysteries of the ancient Mayan culture on this fascinating full day sightseeing tour from Riviera Maya. Chichen Itza is a famous archaeological site of the mystical Maya-Toltec civilizations. Although excavations have been going on for many years, archaeologists can still only speculate about what happened here and why. Immerse yourself in awe-inspiring archaeological places you are ever likely to visit. Lunch, snacks and all entry fees are also included. Spectacular Chichen Itza holds both mystery and magic. Explore the most important archaeological zone and ancient capital of the Mayan Empire on a full day guided tour from Cancun. Admire the majestic observatory, the sacred cenote, the ball court and the castle. Sample typical Mayan cuisine at a buffet lunch with folkloric dancers before beginning your tour of the famous UNESCO World Heritage Site. Visit the most important archaeological zone of the Mayan world, the ancient capital of the Mayan Empire on a full day guided tour. Witness the remnants of the once powerful Mayan people and visit the Sacred Cenote where sacrifices took place. You'll have the opportunity to see the Ball Court, where Mayan games of strength and skill were held, the Castle and Pyramid of Kukulkan. Recently declared as one of the 7 Modern Wonders of the World, Chichen Itza is a must when visiting Mexico!